Founded in 1649, Annapolis has many stories to tell. Among our travel goals was take time and absorb some of that history. 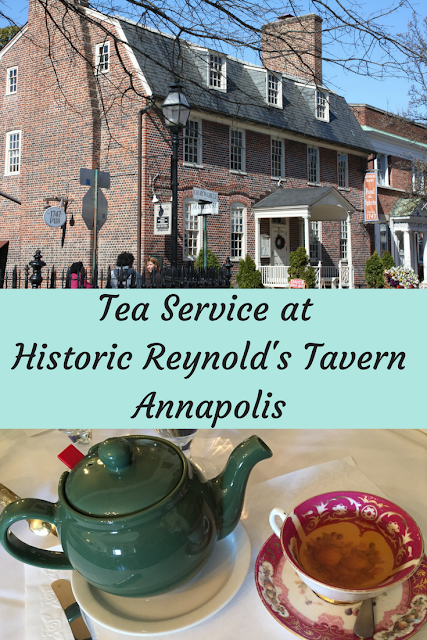 Tea service at the historic Reynold's Tavern provided us an opportunity to relax and savor some the history of Annapolis while indulging in one of our favorite treats. 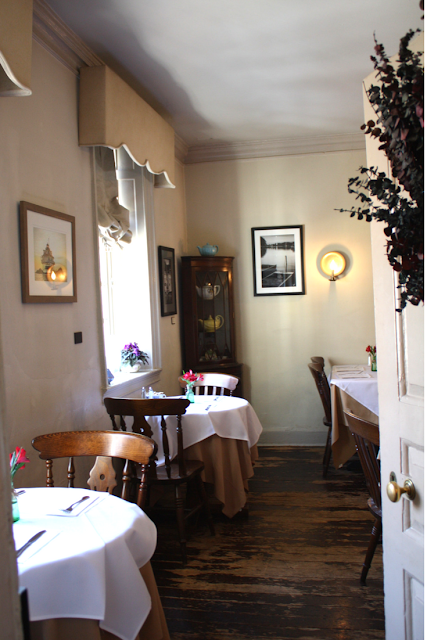 The historic setting, splendid tea service and overall ambiance drifted us to colonial times. 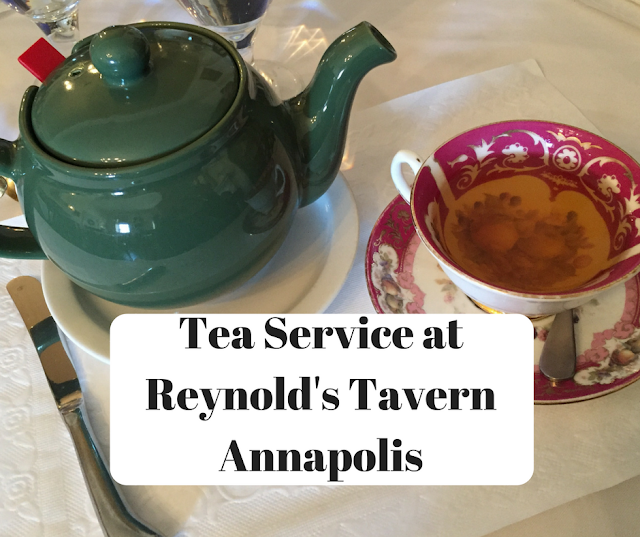 Historic Reynold's Tavern is a special spot for tea! The Reynold's Tavern is only footsteps away from the Annapolis Visitor Center and the Maryland State House. So, it is in a perfect location for a day in Annapolis. We opted to have our tea service early in the day at 11AM but you can easily fit it into your Annapolis adventure later in the day as an afternoon repast. The original structure dates back to 1737. While updated throughout the centuries, elements of the original home remain in the interior. 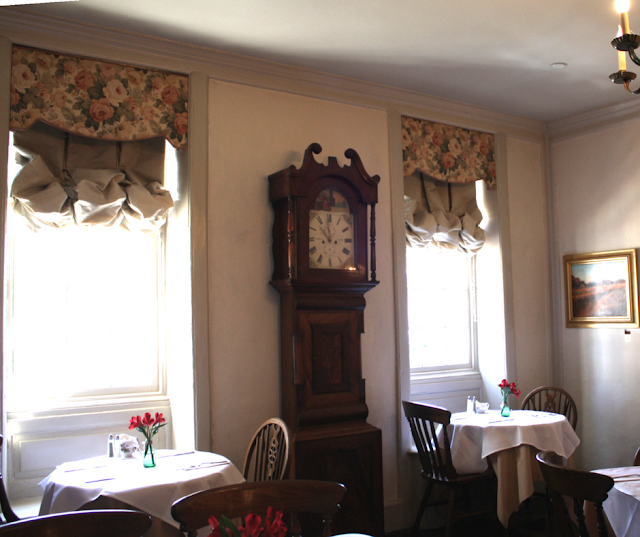 The restaurant does maintain an early America feel. Throughout, we discovered tea pots and cups as well as art for sale on the walls. A pleasant pot of tea! Tea Time Tips: Getting ready for your first tea? English Afternoon Tea - 7 Rules of Etiquette will help you navigate where to start and how to stir! Delight came over us when tea arrived. We chose from a wide variety of loose leaf. Tea pots are bottomless. So, you can try multiple varieties! When they are not so busy, some patrons stay for awhile sipping tea and reading books. How can you not want to dive into this French and onion soup? There are 8 different tea services to choose from. Wow! Already, I know I need to come back to try different options. My husband chose the Colonial High Tea and my daughter and I enjoyed the Savory Tea. 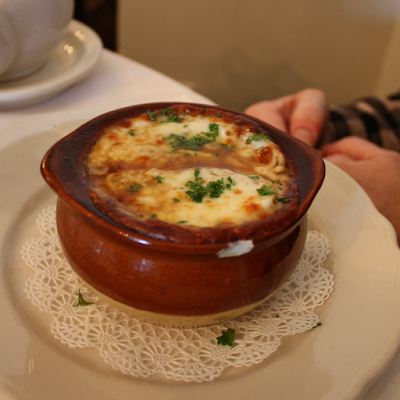 My husband's tea service started with a decadent French onion soup. A sampling of tea sandwiches, mini quiches and a warm fresh scone! My daughter and I received plates with our tea treats which included a scone of our choosing, finger sandwiches and mini quiches. Delicious adventure! A tower of tea treats! Warm orange blossom scone, clotted cream and preserves. The sampling of food during tea is quite a novelty. We traveled through our edible adventure and truly fell in love with Reynold's Tavern. We know that it is a new must stop location during future trips to Annapolis. Reynold's Tavern affords a pleasant opportunity to sit, sip some tea and be part of Annapolis! Those trays of treats look scrumptious! How fun! As a tea lover, I need to put this on my list the next time that I am in Annapolis.